The Louise Blouin Foundation presents Finzi Quartet with Sarah Moule and Andrew Radley in the exploration of 20th and 21st century works for string quartet with music by Schonberg, Finzi, and Michael Berkeley who will enlighten with a pre-concert talk. The Finzi Quartet was formed under the guidance of the late Dr Christopher Rowland at the Royal Northern College of Music. Recently selected by the Tillett Trust and the Park Lane Group, 2009/2010 sees the Quartet's debut at both the Wigmore Hall and the Purcell Room in London. 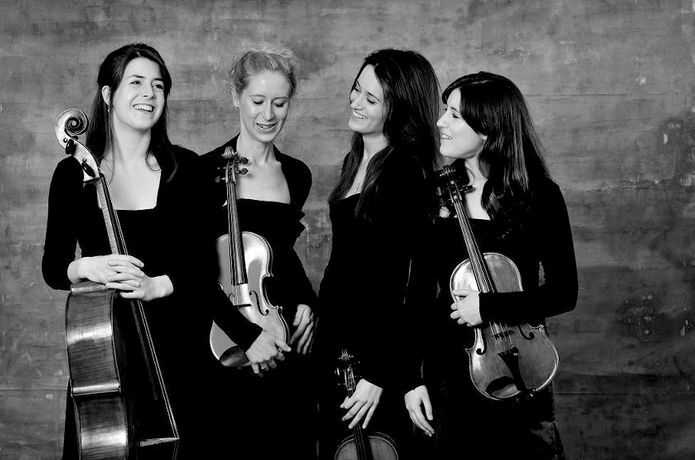 Winner of 2nd Prize in the 2009 Trondheim International String Quartet Competition in Norway, the Quartet is also a recipient of this years' Tunnell Trust Award for Young Musicians and as a result will be undergoing a concert tour of Scotland in November. Having recently undertaken a two-week Residency in Aldeburgh following visits to the Britten-Pears International Academy of String Quartets in 2006 and 2008, future projects include an Artsreach Residency in Dorset and several visits to Madrid to continue their work with Guenter Pichler (first violin, Alban Berg Quartett). Trinity College of Music has appointed the Finzi Quartet Bulldog Junior Fellows in String Quartet for 2009/2010. Having a strong desire to promote the music of English composers, the Quartet feels extremely honoured that the Finzi Trust supports their use of Gerald Finzi's name.